Now that I’ve finally unlocked Conquest mode in Smite, I don’t see myself leaving anytime soon, regardless of the other modes that I’m sure I will be unlocked in the near future. Conquest is a tried and true MOBA map, and it feels great running around it from one point to another, and the controls are great and customizable to the point where there’s something for everybody. As a result, everything simply flows together and just work. I was curious how Hi-Rez would solve the problem of not being able to move the camera off the controlled immortal, as can be done in other MOBAs. 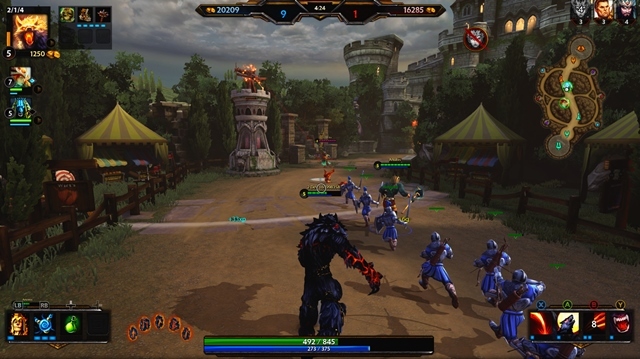 The studio worked around this by giving all allies and enemies in vision a faint outline with a health bar on the field, making them easy to see. The only crucial thing to take away from what I just said is that everything works how one would expect on a PC, which is all anyone is really asking for. Anyway, remember how I pretty much only played Ymir in Arena? Well, by day three I had discovered playing Ymir in the support position, and I fell in love with him all over again. 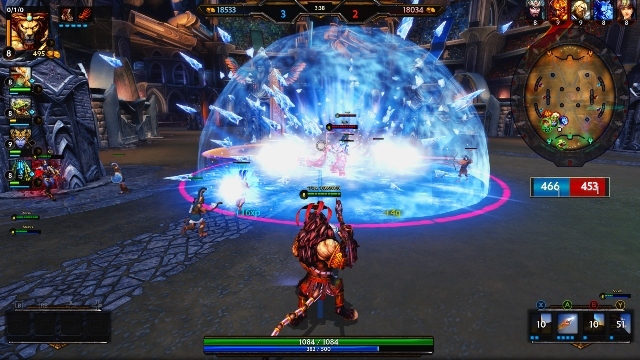 The little bit of skill I had built up on Ymir from Arena definitely gave me a leg up over players trying new champions. I’m fortunate to have discovered an immortal that I can thoroughly enjoy so early on. I was setting up kill after kill for the carry, a support’s job, and being able to actively see a player snowball their advantage into something massive is a beautiful sight to behold. But after close to a week of playing Conquest, I’ve begun to notice some trends in most players that are easily fixable and would improve everyone’s play. Granted, some of the following do’s and don’ts apply to more than just Smite, but that doesn’t lessen their value here in the slightest. Buy wards — Wards are a critical part of Smite, and all too often there will only be one player on a team that buys them. If someone needs glasses to see they wouldn’t just leave them behind when they go play a game of football. If they did, how would they be able to play optimally? The same logic goes for wards, while they aren’t needed to win a game, they sure as heck make it a lot easier to play well and hopefully win. They allow vision for three minutes and allow the entire team to see any enemies that walk through the ward. They tell the team where an enemy is or, sometimes more importantly, is not, so that strategically sound decisions can be made. And since wards aren’t typically bought by players in lower-level Smite play, there’s a pretty good chance the other team isn’t using wards, thus making your victory all the easier. Communication is key — There’s no basic text chat as is common on the PC, thus making communication a little harder. There are pings accessible via the D-Pad, but it can be hard to find exactly what you’re looking for — if it’s even there. 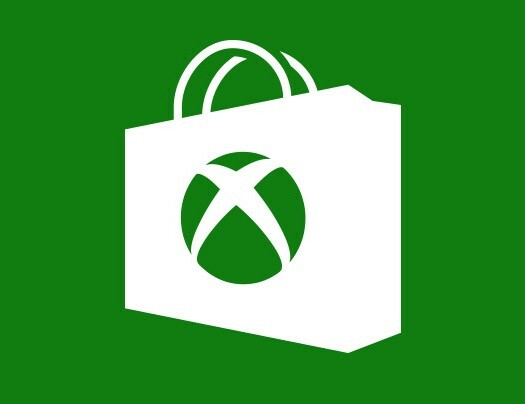 However, team voice chat is in place, and every Xbox One comes with a decent headset, so one would think that would be the go-to way to communicate. Yet, I rarely find more than one other person using voice chat. Communication, as in nearly every sport, is key. How else can you tell your team what you’re doing in-game, tell what the enemy is doing or have a basic discussion of strategy on how to win the game? The short answer is that those things simply fade away, which is in no way conducive to a win or a good time, so be sure to use that headset and get comfortable talking to others. Follow the basic meta — Now, when I say “basic meta,” I mean the most basic that you can get. I don’t mean best items, best immortals, etc, I mean the five positions and where they go on the map. For those who are unaware, the positions and their placements are as follows: The short lane is a solo lane and thus has only one player per team occupying it. It is the most versatile lane in the game, and nearly any one class can be played here; warriors and mages are most common. Next is the jungle, which encompasses all of the neutral camps on the maps. There is one player per team in this role, and they run around clearing jungle camps and setting up ganks and kills for allied lanes. Typically an assassin is played since they have such a high burst damage for ganks. The middle lane is typically filled by a mage. The long lane houses two teammates per team: the carry and the support. The carry is typically a ranged physical attacker, a hunter, and is able to output consistent damage for a long period of time. The support is usually a Guardian, so they are pretty tanky and have strong crowd control (CC). Their main purpose, as mentioned earlier, is to use their CC to set up kills for their carry and get them to snowball the game. The longest lane in the game is for the carry and support because they have the ability to escape across a long distance, whereas other roles wouldn’t be able to make it that far back to their turret. Ask and experiment — There’s nothing wrong with being bad at a MOBA, in fact everyone at some point in their play time was downright awful. The only problem is when nothing is being learned from each game, which can be hard to do, especially for players just starting out when everything looks confusing to them. So be sure to ask questions — there will almost always be at least one person on the team willing to step up and help a fellow player. Don’t let the fear of appearing foolish stop you from trying new immortals or stop you from finding out more about the game. Players of every skill level should have the sole goal of learning and getting better. There’s always something new to be discovered, and there’s always room to improve even for those who are playing professionally. Be toxic — Being on the internet doesn’t suddenly mean that players can simply forget basic human courtesies. There is no need for rudeness toward other players, and there is certainly no need for yelling or inappropriate noises. There’s no reason to berate other players regardless of their skill level, and better players should be there to serve as teachers to further lower-skilled players. Just like in kindergarten, the golden rule applies to Smite: you should treat others the way you want others to treat yourself. 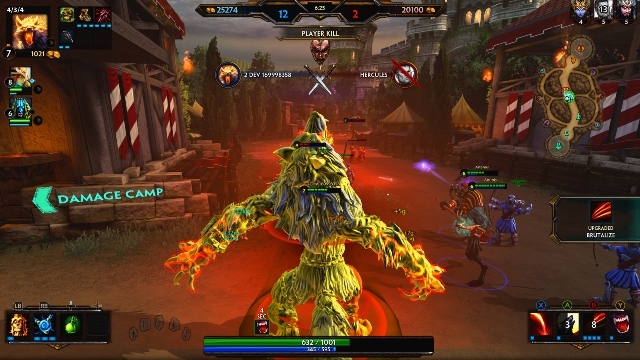 Leave — Smite games, at least in Conquest, can last up to 40 minutes. When beginning to queue for a match, please factor that into whether or not you should play another game. If there’s somewhere you need to be in a relatively short period of time, then please don’t click accept. Those of us who will be sticking around for the match would rather sit for another minute in queue than have to play a 4v5 or any other less than intended match-up. Also, please don’t leave if you’re having a bad game. Believe me, we get it. No matter who you are everyone has a bad game. But please don’t rage quit a match just because you’re not doing so hot; everyone would much rather have a full 5v5 than a match with a disconnect. Besides, there’s always a chance that everything just clicks, and you turn it around. Take losses poorly — We’ve all had those games where the win seems to be up for grabs for both teams until the very end. You poured your heart and soul into the game and tried your hardest, maybe even had one of your best games, but in the end you just couldn’t come out with that win. The best thing to do after games like that is to simply let it go — after all, it’s only one game — and learn from what happened. Because no matter how well you played, it wasn’t perfect, and you can always learn from mistakes. Close games are often the most valuable ones to play through because they can’t be played with the mind on autopilot. You need to be focused 100 percent of the time if you have any aspirations of winning. However, taking losses hard and getting down in the dumps after a close game will only negatively affect how you play in future games that day. If you know you can’t handle tough losses, then I highly recommend taking a break after after suffering through one and waiting a little bit before queuing again. This list is definitely more skewed towards newer em>Smite players, but that doesn’t make it any less valuable for veterans. Think of what’s been listed here as the fundamentals of Smite. Without knowing the fundamentals, how can anyone expect to succeed? Just as in all sports, fundamentals are crucial to winning, and they allow us to be able to make the flashier plays later on in the game. They aren’t the most fun thing to keep in mind while playing MOBAs, but once players have them perfected, everything suddenly becomes so much easier.